In the Spring of 1934 Schwartz and Weisinger formed the earliest literary agency focused on representing science fiction authors, Solar Sales Service. Leveraging the contacts with editors and writers they had made through Science Fiction Digest, they quickly signed up an impressive stable of clients. In a letter to Otto Binder on May 25, 1934, Weisinger outlined their view of the science fiction field and solicited Binder’s business. 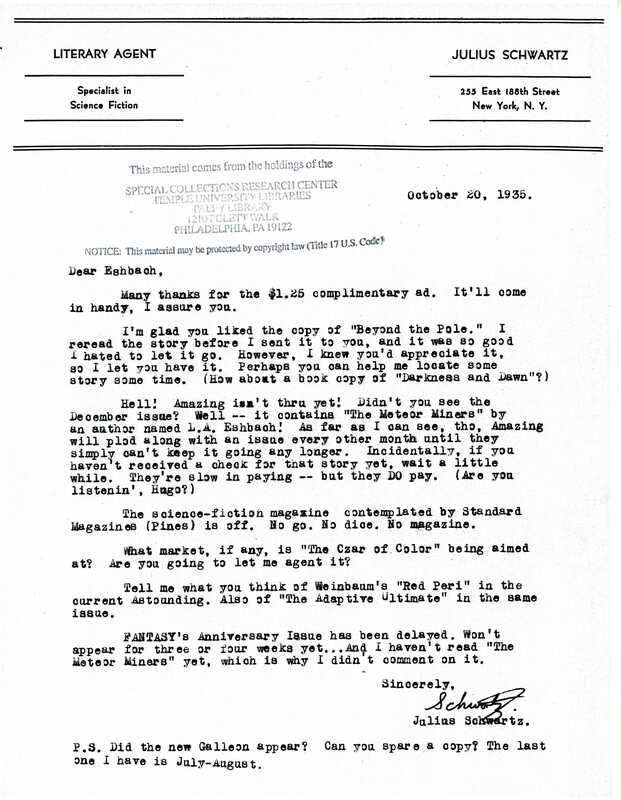 Schwartz continued his correspondence with Eshbach on his “Literary Agent” letterhead, exchanging copies of stories and industry news and also seeking more of Eshbach’s writing to resell.